Dissemination tours and creation of awareness among the user community are constantly organised by personnel involved in BONVOYAGE through invited guest lectures and BONVOYAGE-organized workshops, as well as with “marketing-oriented” presentations at industry events or in bilateral discussions with operators who are the final users of BONVOYAGE’s results. All the achievements and activities in communicating BONVOYAGE are reported step by step in this page. Main targets of the EWGT concern providing a forum to share information and experiences of research activities, encouraging joint research and the development both of theoretical methods and applications. Primary field of interest concerns OR methods, mathematical models and computation algorithms to solve and support the solution of problems faced by public administrations, city authorities, public transport companies, service providers, logistic operators and so on. Carlo Mannino from SINTEF attended this Working Group which represented a Stakeholder meeting for future exploitation of the project’s results. The 2015 conference was entitled “Fast Algorithms”, namely algorithms capable to find, deterministic or with high probability, optimal or approximated solutions to some optimization problems on large networks. Due to the very nature of BONVOYAGE, this conference was the perfect context to present the project which aims at solving complicated routing problems on a gigantic network (Europe level), in real time. Carlo Mannino from SINTEF presented BONVOYAGE in the “Open Problem” session. The ITS World Congress is an annual international conference focused on Intelligent Transport Systems. Each year, the World Congress is hosted in one of three regions; Europe, Asia-Pacific and the Americas. The regional ITS associations, ERTICO – ITS Europe, ITS Asia-Pacific and ITS America, each host the World Congress when it falls in their respective region every three years. The ITS World Congress 2015 was held in Bordeaux and Michael Kieslinger from FLUIDTIME presented BONVOYAGE Project. The Dagstuhl Seminar brings together researchers from algorithm engineering, operations research, and combinatorial, stochastic and robust optimization. Because participation is only by direct invitation from the program committee, the selection of attendees is very careful, and many leading scholars in transport optimization attended the seminar. This makes the seminar a perfect arena to introduce new ideas or projects The 16171 seminar covered topics related to the planning of public transport systems, and to their real-time operational management. The seminar focused on handling large amounts of data, as well as on the application of quantitative models and algorithmic methods for solving the relevant problems in these areas. Carlo Mannino from SINTEF attended the workshop and presented in informal talks the BONVOYAGE project to the other attendees. The Congress theme is “Delivering Future Cities Now” co-organized by ERTICO and 5GPPP will take place in Glasgow and CNIT will present BONVOYAGE project in the frame of the Workshop “5G pushing the limits of innovation in Automotive” focused on Automated driving. This workshop aims at providing first an insight into the 5G concept, explaining what 5G is about. Furthermore the workshop will address the specific needs of the automotive sector and what benefit are expected from the 5G networks. Trenitalia participation in the conference was aimed to present and discuss themes related to state-of-the-art and innovative features and functionalities of the journey planning tools, with specific focus on multi-modal mobility, through the cooperation among several types of transport operators, increase of customer mobility experience and so on. BONVOYAGE Project was presented as an example of innovative project in the field and as one of the innovation initiatives that Trenitalia is carrying out at European level. 7. IEEE Globecom 2016, Washington, DC USA 4-8 December 2016. CNIT presented the paper “OpenGeoBase: Information Centric Networking meets Spatial Database applications” at IEEE Globecom 2016, Workshop on Information Centric Networking Solutions for Real World Applications. The presentation given describes the federated spatial database architecture, named OpenGeoBase, which is based on ICN technology and that the BONVOYAGE project is proposing to support the ITS Directive 2010/40/EU of European Union (Action A – Travel information and linking services). Such a database provides geo-sharing of the spatial data, geo-routing of queries/insertions and data-centric security, which are attractive features for realizing a network of National Access Point, offering cross border discovery functionality for ITS data and services, as foreseen by the EU directive. Mauro Losciale from CNIT presented the BONVOYAGE Communication System in the 19-th INW meeting, in the “Mobile Data and Applications” session. Specifically, he presented the novel information centric communication bus for distributed Intelligent Transportation Systems, based on Internames and developed in the EU H2020 BONVOYAGE project. The presented communication bus offers a scalable dissemination of travel-centric contents through a standardized interface and the publish-subscribe scheme, while ensuring interoperability across borders. To prove its suitability in real scenarios, Mauro described its functionalities (including namespace, data processing, and caching) properly conceived to handle the delivery of traffic-related information formatted according to the DATEX II standard and exposed by the european NPRA transportation provider. Finally, he discussed some preliminary experimental tests, which demonstrate that the proposed solution outperforms baseline mechanisms in terms of both processing complexity and bandwidth consumption, while registering good performance even in large scale environments. Prof. Andrea Detti, BONVOYAGE’s coordinator will attend as Panellist to the Session INV21: Sustainable Multimodal Door to Door Travel, which focus will be on research and innovation activities related to solutions for passenger needs to support anytime, anywhere door-to-door intermodal journeys. Prof. Nicola Blefari Melazzi from CNIT presented the OpenGeoBase platform under development in BONVOYAGE. CES is a Business-to-Business Matchmaking event which organises speed meetings between “Born Global” startups and international SMEs and potential strategic partners and investors from US and global market as well. 4. North Atlantic Treaty Organisation (NATO), Science and Technology Organisation, Specialists’ Meeting – SET- 222, on “Swarm Centric Solutions for Intelligent Sensor Networks”, Rome, Italy, 07-08 June 2016 (invited paper). Simon Ollander, Christelle Godin, Sylvie Charbonnier, Aurélie Campagne “A Comparison of Wearable and Stationary Sensors for Stress Detection“. 7. Proc. of IEEE International Forum on Research and Technologies for Society and Industry Leveraging a better tomorrow (RTSI), Bologna, Italy, Sep., 2016. P. Boccadoro, M. Barile, G. Piro, and L. A. Grieco “Energy consumption analysis of TSCH-enabled platforms for the Industrial-IoT”. Andrea Detti, Nicola Blefari Melazzi, Michele Orru, Riccardo Paolillo, Giulio Rossi: “OpenGeoBase: Information Centric Networking meets Spatial Database applications”. 9. The Third International Workshop on The Emerging Future Internet and Network Security (EFINS 2016) in conjunction with Trustcom 2016, 23 – 26 August 2016, Tianjin, China. Salvatore Signorello, Maria Rita Palattella, Luigi Alfredo Grieco: ” Security Challenges in future NDN-Enabled VANETs”. 10. 19th International Conference on Intelligent Transportation Systems – IEEE ITSC 2016, Accepted Paper, 1 – 4 November 2016, Rio de Janeiro, Brazil. Lorintiu Oana, Vassilev Andrea: “Transportation mode recognition based on smartphone embedded sensors for carbon footprint estimation”. 11. 27th Scientific Meeting Italian Association of Engineering Management – RSA AilG 2016, Accepted Paper, 13 – 14 October 2016, Bergamo, Italy. Avenali A., Bracaglia V., D’Alfonso T., Reverberi P.: “Revenue sharing mechanisms for airline-High Speed Rail cooperation under congested hubs”. 12. IEEE International Conference on Communications 2017 – Proc. of IEEE ICC 2017, 21-25 May 2017, Paris, France. Mu Wang, Changqiao Xu, Shijie Jia, Jianfeng Guan, and Luigi Alfredo Grieco: “Preference-aware fast interest forwarding for video streaming in information-centric vanets”. 13. IEEE ICC 2017 – 2nd Convergent Internet of Things (C-IoT) Workshop – 21-25 May 2017, Paris, France. S. Sicari, A. Rizzardi, L. A. Grieco, and A. Coen-Porisini: “A secure ICN-IoT architecture”. 14. 2016 Kuhmo NECTAR conference on Transportation Economics ITEA – 15th-17th June 2016, Santiago De Chile, Chile. Jiang, T. D’Alfonso, Y. Wan: “Market Structure and Partnership Levels in Air-Rail Cooperation”. 15. IEEE LANMAN 2017: the 23rd IEEE international Symposium on Local and Metropolitan Area Networks – 12th -14th June 2017, Osaka, Japan. Andrea Detti, Michele Orru, Riccardo Paolillo, Giulio Rossi, Pierpaolo Loreti, Lorenzo Bracciale, Nicola Blefari Melazzi: “Application of Information Centric Networking to NoSQL Databases: the Spatio-Temporal use case”. 17. IEEE AVSS 2017: 14th IEEE International Conference on Advanced Video and Signal-Based Surveillance. 29th August 2017, Lecce, Italy. Agnese V. Ventrella, Giuseppe Piro, and Luigi Alfredo Grieco: “Information-Centric Networking in Environmental Monitoring: an overview on publish-subscribe implementations”, Proc. of IEEE International Workshop on Intelligent Technologies for Environmental Monitoring (in conjunction with AVSS 2017). Agnese V. Ventrella, Giuseppe Piro, and Luigi Alfredo Grieco: “Information-centric publish-subscribe mechanisms for Intelligent Transportation Systems”, Proc. of IEEE International Workshop on IoT applications in Intelligent Transportation Systems and Logistics (conjunction with the SOLI 2017). Giuseppe Piro, Giuseppe Ribezzo, Luigi Alfredo Grieco, and Nicola Blefari-Melazzi: “A de-verticalizing middleware for IoT systems based on Information Centric Networking design”, Proc. of Tyrrhenian Workshop 2017: Towards A Smart And Secure Future Internet. 20. IABE Conference – International Academy of Business and Economics, July 2017. Avenali, A., Bracaglia, V., D’Alfonso, T., Reverberi, P.: “Incentives to airline-high speed rail cooperation under hub congestion: an antitrust perspective”, Proceedings of 2017 International Association of Business and Economics (IABE) Conference. Gaël Vila, Simon Ollander, Christelle Godin, Etienne Labyt, Sylvie Charbonnier, Aurélie Campagne: “Real time monitoring of traveller’s psychological stress”. Lukas Bach, Dag Kjenstad, Carlo Mannino: “”Orchestrator” approach to multimodal continental trip planning”. 23. IEEE International Conference on Communications – ICC 2018, 20-24 May 2018 – Kansas City, MO, Usa. Piero Boccadoro, Giuseppe Piro, Domenico Striccoli, Luigi Alfredo Grieco: “Experimental comparison of Industrial Internet of Things protocol stacks in Time Slotted Channel Hopping scenarios”. 24. Information Centric Networking Solutions for Real World Applications (ICN-SRA), IEEE ICC 2018, 20-24 May 2018 – Kansas City, MO, Usa. Mauro Losciale, Pietro Boccadoro, Giuseppe Piro, Giuseppe Ribezzo, Luigi Alfredo Grieco, Nicola Blefari-Melazzi: “A novel ICN-based communication bus for Intelligent Transportation Systems”. 25. European Wireless 2018 , Catania, Italy, 02 – 04 May 2018. Pietro Boccadoro, Mauro Losciale, Giuseppe Piro, Luigi Alfredo Grieco: “A standard-compliant and information-centric communication platform for the Internet of Drones”. 26. 4th International Conference on Vehicle Technology and Intelligent Transport Systems, Funchal, Madeira, Portugal, March 16 – 18, 2018. L. A. Grieco et al. G. Piro, S. Signorello, M. R. Palattella, L. A. Grieco, G. J. Boggia, and T. Engel. G Piro, M. Amadeo, G. Boggia, C. Campolo, Grieco L. A., A. Molinaro, and G. Ruggeri. D’Alfonso T., Jiang C., Bracaglia V.
Jiang, T. D’Alfonso, Y. Wan. Changqiao Xu, Mu Wang, Xingyan Chen, Lujie Zhong, Luigi Alfredo Grieco. IEEE Transactions on Mobile Computing, 2018. A. Detti, L. Bracciale, P. Loreti, N. Blefari Melazzi. The BONVOYAGE Partner, FLUIDTIME, attended to the International symposium and gave a presentation about BONVOYAGE objectives and Scope. The biennial UITP World Congress and Exhibition offers participants a unique opportunity to discover the public transport market develop-ments and learn from industry leaders. The Meeting created synergies with other EU Projects forming the Open Data Work Group of the H2020 ITS Cluster, namely: ITS Observatory, EuTravel and MASAI. The scope of the Open Data WG is to support the sharing of data sources among the project of the H2020 ITS Clusters. The role of the BONVOYAGE project is both to share its data and to offer a common data-sharing platform based on ICN technology. CeBIT is the largest and most internationally represented computer expo. Roman Pick from FLUIDTIME presented BONVOYAGE project. Special Dissemination has been performed on BONVOYAGE‘s Twitter channel. CEA – Leti presented BONVOYAGE Project at the PhyCS 2016 Conference and exposed the Project Poster. A dedicated News has been published. CNIT participated in the second H2020 ITS workshop in which the possibility for BONVOYAGE to support a common repository of ITS data and services based on OpenGeoBase was discussed. The presentation is available here. Prof. Francesco Delli Priscoli, Alessandro Di Giorgio, Antonio Pietrabissa and Lorenzo Ricciardi Celsi from CRAT presented the BONVOYAGE project, the BONVOYAGE platform architecture and the innovative activities carried out in the project, with particular attention to WP2 and WP4. 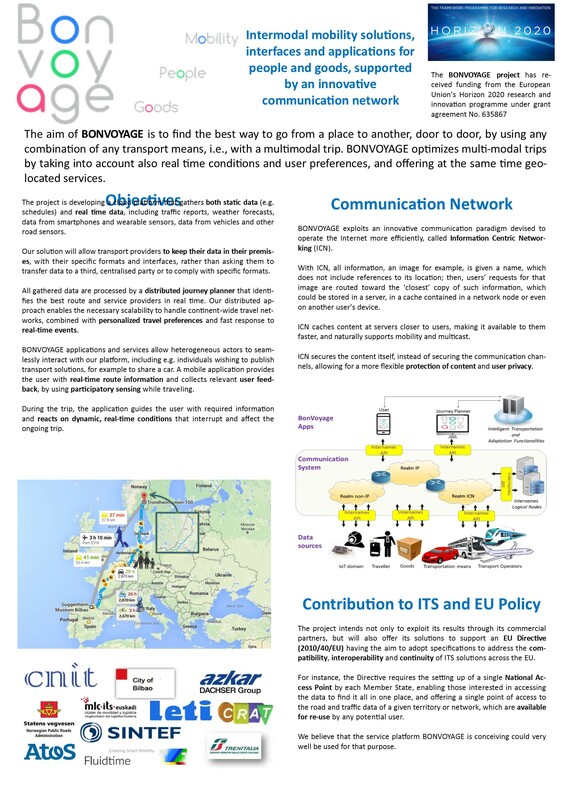 A special poster has been exhibited showing the rationale behind the design of the User Profiling Tool, the Multi-Objective Optimization Tool and the Car Pooling algorithms.